Big Questions In Science- 4) What drives the movement of animal populations? For seven years, researchers from Biology Professor William Fagan’s lab have traveled the frigid Antarctic seas to study how environmental changes affect penguin populations. When their touring vessels stop along the Antarctic Peninsula, the researchers disembark to painstakingly count each penguin and examine their breeding, nesting and feeding patterns. Using statistical and spatial analysis, Fagan’s team has concluded that climate change is upsetting long-entrenched penguin dynamics, causing the population of two breeds to dwindle, while a third increases. With NSF funding, Fagan is developing a suite of bioinformatics tools to better analyze the movements of animal populations. 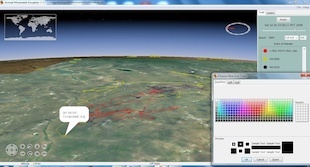 “There is no one-size-fits-all tool because the data sets can differ greatly,” notes Fagan, who is applying the tools to three different case studies: blacktip sharks swimming off Florida’s coast, whooping cranes migrating from Wisconsin to Florida and nomadic gazelles traveling up to 1,000 kilometers per year across Mongolian grasslands. The gazelle study builds off an earlier collaboration with the Smithsonian Institution that tracked the animals adorned with GPS-enabled collars, motion-detecting sensors and satellite uplinks. “Basically, you sit back and wait for the animal to send you an e-mail telling you what it has been up to,” says Fagan. The result is a long record of movement data, no matter where the animal travels—quite different than the other two data sets. The sharks are embedded with radio frequency identification tags, which allow them to be tracked via triangulation as they swim through a fixed area. Data collection on the whooping cranes depends on the efforts of government scientists and birdwatchers across the country who identify individual birds by unique tags. The tools should help ecologists better understand what drives the movement patterns of a specific population—be it social dynamics, territoriality, the prevalence of predators or the search for resources—and assist them in developing appropriate conservation measures. 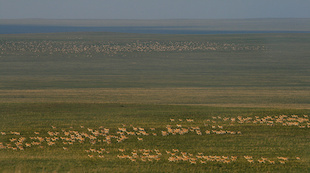 In the case of the Mongolian gazelles, effective conservation efforts will need to consider the gazelle’s nomadic nature, driven by its search for food across highly variable grasslands, says Fagan, who also is associate director of research innovation at SESYNC, the National Socio-Environmental Synthesis Center in Annapolis, a multidisciplinary, five-year, NSF-funded university initiative.